ow much weight will I lose through this twenty-week exercise program? Maybe six or seven pounds. How fast will I lose the weight? Oh, a pound or so a month. Are you sure about this? Not really. Individualized weight-loss predictions in response to exercise interventions are pretty inaccurate. What type of exercise will burn the most fat? We’re not too sure, but probably low-intensity aerobic exercise. 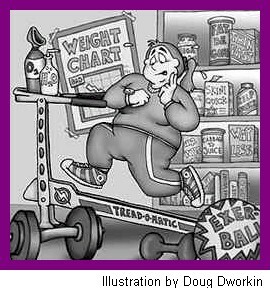 If my exercise prescription is geared toward fat metabolism, will that translate into greater weight loss? Can’t really say. If I add exercise to my very restricted diet, will I lose weight faster? Probably not. Will exercise training have a significant impact on my resting metabolic rate? It may be a small effect, but we can’t be sure. Will exercise training increase my lean body mass? Lean body mass can be maintained or slightly increased through exercise, but probably not enough to affect your overall metabolism. Will exercise help me maintain my newly reduced body weight? Most likely, but only when the exercise behavior is maintained. Should I invest all this time, money, and effort into months of exercise training to lose weight when I can’t be sure how it will affect my weight? I wouldn’t if I were you. Instead, I would make an investment in something I can clearly foresee the benefits of. Will this new exercise program reduce my blood pressure? Yes. Will the exercise reduce my resting heart rate? Most likely. Will it improve my cholesterol levels? Yes. Will it improve my blood triglycerides? Yes, with the help of a healthy diet. Will exercise reduce my risk of cardiovascular disease? Yes. Will an exercise program get my blood glucose under control? It will at least help, if not eliminate your glucose problems altogether. Will it reduce my risk for developing diabetes? Yes. Will exercise reduce my risk or symptoms associated with the other chronic diseases such as certain types of cancers, bone and joint problems, or muscle function? Yes. Will exercise training enhance my quality of life? Yes. Will exercise reduce my risk for early mortality? Yes. What if I exercise and don’t lose much weight? Can I still expect these other benefits? Certainly, as long as you maintain your exercise program. WAYNE C. MILLER, Ph.D., is a professor of exercise science and nutrition at George Washington University Medical Center, as well as their director for the Healthy Weight Management programs. He speaks at health-related conferences nationwide. His e-mail is wmiller@gwu.edu. Compiled by Pat Lyons, R.N., M.A., director, Connections: Women’s Health Consulting, author, and size-acceptance speaker. Pat lives and works in Oakland, California.